I was inspired to write this parody of the American children’s classic, Goodnight Moon, by several Chinese gun and weaponry books for young children. The first book for is,《超级小枪迷》(Super Small Gun Enthusiast, Chāojí Xiǎo Qiāng Mí). This book features 71 full-color photographs of pistols, rifles and automatic weapons, each labeled with basic information and country of make. Other books in this series, as listed on the back cover, include more predictable children’s titles, such as: Animal Stories, English ABCs, (Chinese) Idioms, and Math 123. The second book is the more cuddly,《武器》(Weapons, Wǔqì). 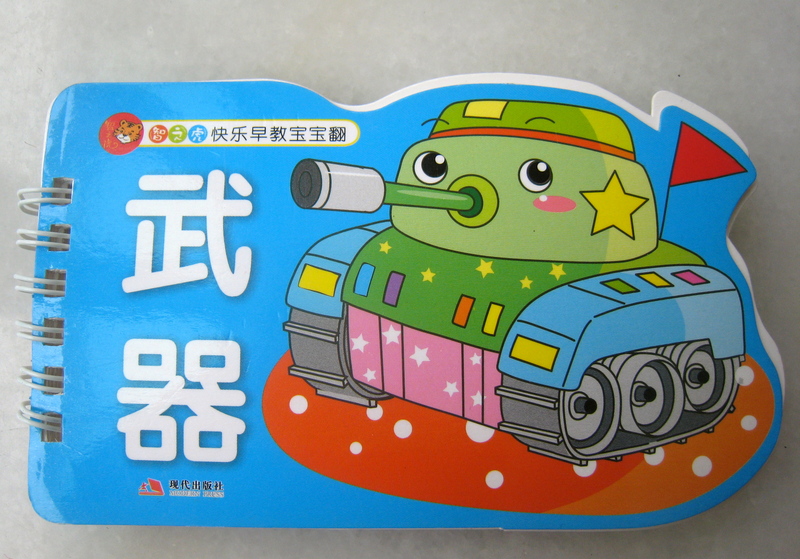 In addition to featuring a super cute tank ( it’s so cheerful, how could it even think of running over 1989’s Tank Man! ), it also catalogues a wider range of weaponry such as air craft carriers, fighter jets, tanks and helicopters. Are you based in China? What grim children’s book gems have you stumbled across in the bookstore? With thanks to Marilyn D. for giving me copies of these too-horrible-too-be-true children’s books. I haven’t stumbled across any books, but here in Singapore at our recent school concert, my son’s class was dressed up in farmer’s costumes, given plastic machine guns, and taught to perform a rousing march in Chinese. It was all a bit cultural revolution. A lot of people asked me what I thought about it afterwards. He has since taught the song and the dance to his 2yo sister. They perform it together often, without prompting. I am looking forward to being home with the relatives for Christmas. Wow! I would have never guessed that of Singapore. Very interesting and very strange. Remember any words to the song? It’s a church kindergarten so it went “I’m in the Lord’s Army!” and so on and so forth. But as someone whose Chinese is too limited to follow along in real time (or indeed without a great deal of help even in non-real time) you can imagine my overall impression. A friend speculated that the compulsory national military service has given locals a different outlook on kids and guns. I’m still not sure where the farmer’s costumes came into it, though. Now that you mention it, my brother and I had cowboy-style cap pistols. Despite it, I think we’re both (relatively) normal and peaceable adults. My brother and I rarely want to kill people. Maybe that’s the solution… give kids guns so they can get it out of their systems asap! Incredible…and yet the longer I live here, the less surprised I am at stuff like this! You’re right that we glorify guns and warfare in the West too, perhaps in a slightly more PC way (on second thought, I have seen pictures of a pink rifle being marketed for young girls in the US…). actually I found sad that guns are recently more marketed toward women and mothers (some with jewlery). even more sad is now school sports team raffles off assault rifles (AR-15) as prizes. Better background checks and more mental health services helps. It’s ridiculous. The computer games (or whatever) kids play these days are horrible. When I’m a parent, I don’t think I’m going to own a TV. My kids are going to hate me! In Seattle, where I’m from, I’m sure the plastic tank would also be looked at with horror! 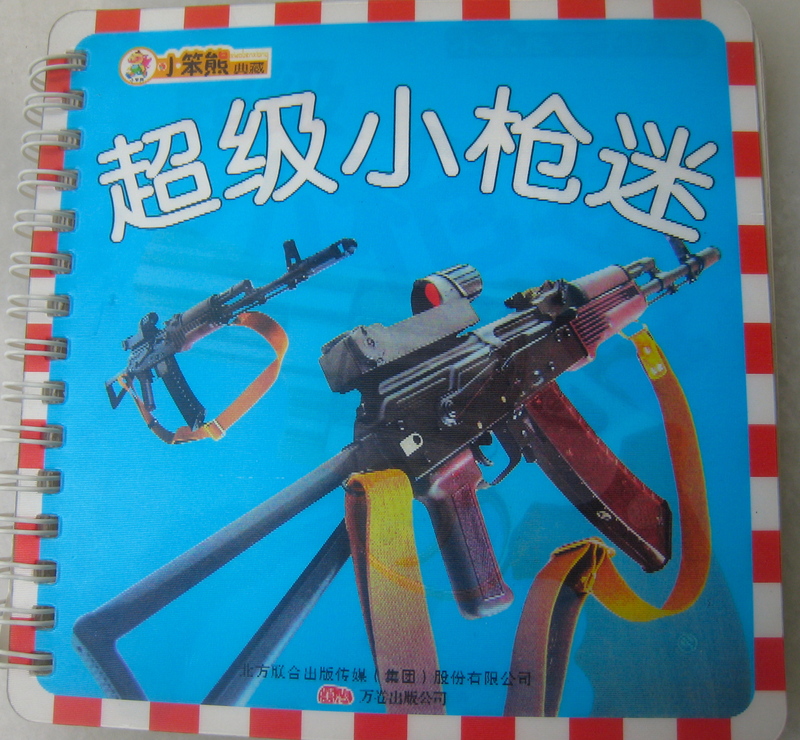 But even here in Hong Kong (vs. Mainland China where these books are from) there was a stall at one school fair selling toy machine guns with mini-platic bayonets on the end. I’ll need to look for these (and similar books) here in Shanghai! Who knew the local book store would be a source of cultural education – even if I can’t read the language! Perhaps your employer would like to get into this odd children’s publishing niche?